The 1905 French law on the Separation of the Churches and State (French: loi du 9 décembre 1905 concernant la séparation des Églises et de l'État) was passed by the Chamber of Deputies on 9 December 1905. Enacted during the Third Republic, it established state secularism in France. France was then governed by the Bloc des gauches (Left Coalition) led by Emile Combes. The law was based on three principles: the neutrality of the state, the freedom of religious exercise, and public powers related to the church. This law is seen as the backbone of the French principle of laïcité (secularism). Prior to the French Revolution of 1789, Roman Catholicism had been the state religion of France, and closely identified with the Ancien Régime. However, the revolution led to various policy changes, including a brief separation of church and state in 1795, ended by Napoleon's re-establishment of the Catholic Church as the state religion with the Concordat of 1801. An important document in the evolution toward religious liberty was Article Ten of the 1789 Declaration of the Rights of Man and Citizen, stating that "No one may be disturbed on account of his opinions, even religious ones, as long as the manifestation of such opinions does not interfere with the established Law and Order." 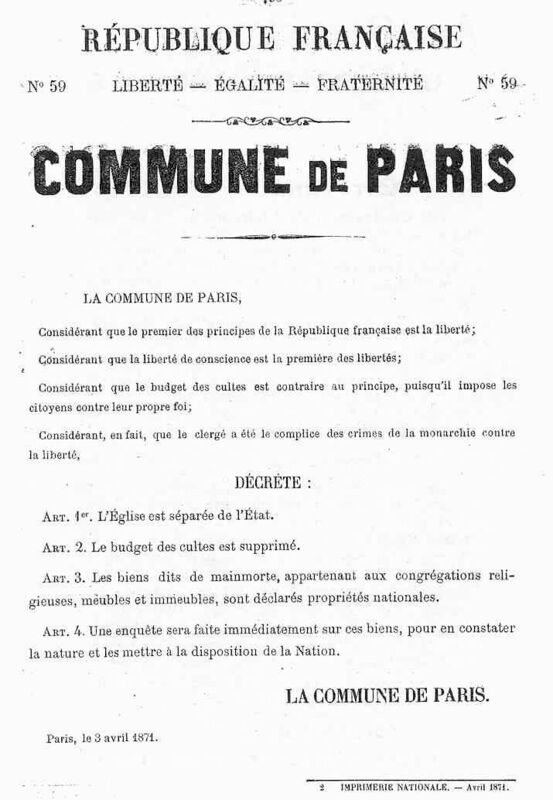 The 1871 Paris Commune had proclaimed state secularism on 3 April 1871, but it had been cancelled following the Commune's defeat. After the 16 May 1877 crisis and the victory of the Republicans at the following elections, various draft laws requesting the suppression of the Concordat of 1801 were deposed, starting with the 31 July 1879 proposition of Charles Boysset. Beginning in 1879, the French state began a gradual national secularization program starting with the removal of priests from the administrative committees of hospitals and boards of charity, and in 1880 with the substitution of lay women for nuns in hospitals. Thereafter, the Third Republic established secular education with the Jules Ferry laws in 1881–1882, which were a significant part of the firm establishment of the Republican regime in France, with religious instruction in all schools forbidden. In 1886, another law ensured secularisation of the teaching staff of the National Education. The 1901 Law of Associations, which guaranteed freedom of association, also enabled the control of religious communities and, notably, limited their influence on education. In 1903, while Emile Combes was minister, a commission was selected to draft a bill that would establish a comprehensive separation between the state and the churches. Its president was the former Protestant pastor Ferdinand Buisson, and its minute writer, Aristide Briand. On 30 July 1904, the Chamber of Deputies voted to sever diplomatic relations with the Vatican following the sanction, by the Holy See, of two French bishops (Albert-Léon-Marie Le Nordez and Pierre Joseph Geay) who had declared themselves Republicans and in favour of conciliation with the Republic. The relationship was not reestablished until 1921, after the Senate accepted a proposition brought by Aristide Briand. Article 1 described the purpose of the act as to ensure "freedom of conscience" and to guarantee "the free exercise of religion under the provisos enacted hereafter in the interest of public order." Article 2 stated "The Republic does not recognize, pay, or subsidize any religious sect. Accordingly, from 1 January following the enactment of this law, there will be removed from state budgets, departments and municipalities, all expenses related to the exercise of religion." Exceptions are ennumerated regarding "schools, colleges, hospitals, asylums and prisons" so as "to ensure the free exercise of religion in public institutions". Article 3 required that an inventory be made of all houses of worship previously supported by the government. Article 4 established a one-year period during which all "movable and immovable property of menses, factories, priests' councils, presbyteries and other public institutions of worship" was to comply with the rules for establishing legal associations under Article 19. Article 5 turned over to the government all property found during the inventory "not subject to a pious foundation created after the law of 18 Germinal Year X". Article 6 required that all loans made to religious organizations previously supported by the state must still be repaid. Article 7 gave authority to assess properties of the religious organizations to the prefect governing the department in which the property was located. Article 8 spelt out the consequences for non-compliance with the above articles. Article 9 (modified in 2015) detailed the methods of distribution of properties not claimed by the religious institutions to charitable organizations and local municipalities. Article 10 (modified in 2015) made provision regarding the taxation of mortgages and transfers of property. Article 11 (repealed in 2011) established pensions for certain clerics and employees of religious institutions. 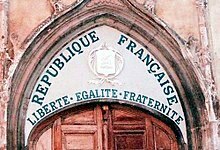 The Republican motto "Liberté, Egalité, Fraternité" was put on in 1905 (following the French law on the separation of the state and the church) to show that this church was owned by the state. Article 12 (amended in 1998) declared that all buildings which the state had made available to religious organizations the property of the state, pursuant to the following articles. Article 13 (modified in 2015) specified that the "buildings used for public worship, and movable objects furnishing them will be left free of charge to public institutions of worship", detailed the methods by which disputed ownership might be determined, and described procedures for reclamation of properties and fixtures abandoned by religious organizations. Article 14 provided the same as Article 13 for "Archdioceses, bishoprics, parsonages and their dependencies, major seminaries and faculties of Protestant theology". Article 15 specified that, "in the departments of the Savoy, the Haute Savoie and Alpes-Maritimes" buildings used "for the exercise of worship or for the accommodation of their ministers" might be "allocated by villages on the territory from which they are" pursuant to Article 12, while "cemeteries remain the property of the villages". Article 16 created a special category for "buildings for public religious worship (cathedrals, churches, chapels, temples, synagogues, archbishops, bishops, presbyters, seminaries), in which will be included all of these buildings representative in whole or in part, artistic or historical value." Article 17 required that any buildings covered by the articles be offered to: "1 religious associations; 2 communes; 3 departments; 4. Museums and art and archaeology societies; 5 to the state," in that order. Article 18 declared religious associations formed consistent "with Articles 5 and following of Title I of the Act of July 1, 1901" "further subject to the requirements of this law." Article 20 allowed associations compliant with "Article 7 of Decree of 16 August 1901" to form unions. Article 21 (modified in 2015) required inventory reporting and auditing of associations and unions. Article 22 (modified in 2015) restricted reserve funds to the "costs and maintenance of worship". Article 23 (modified in 2015) stated the consequences of failure to comply. Article 24 exempted buildings used for religious purposes from certain property taxes. Article 25 declared all worship services open to the public. Article 26 banned "political meetings on the premises normally used for the exercise of worship". Article 27 (amended in 1996) regulated bell ringing. Article 28 banned religious symbols "on public monuments or in any public place whatsoever, except for buildings used for worship, burial grounds in cemeteries, monuments and museums or exhibitions." Article 29 held both ministers and congregants responsible for obeying these regulations. Article 30 (repealed in 2000) forbade religious instruction in state schools for students between six and thirteen years of age. Article 31 set out criminal penalties for any person "who, by assault, violence or threats against an individual or by making him afraid of losing his job or expose to damage his person, his family or his wealth" prevents another person from practising or contributing to a religious organization. The same holds for any person forcing another to participate in or contribute to any religious organization. Article 32 specified punishment for "those who have prevented, delayed or interrupted the exercises of worship". Article 33 stated that Articles 31 and 32 only apply to situations that do not qualify for "more severe penalties under the provisions of the Penal Code." Article 35 provided for criminal penalties for seditious statements made by religious ministers in places of worship. Article 36 held liable for any damages the association involved in any conviction under Articles 25, 26, 34, and 35 civilly. Article 37 related to the applicability of "Section 463 of the Penal Code and the Act of March 26, 1891" to this Act. Article 38 "Religious congregations remain subject to the laws of 1 July 1901, December 4, 1902, and July 7, 1904." Article 39 made benefits of certain seminary students granted by "section 23 of the Act of 15 July 1889" contingent upon their receiving ministerial employment. Article 40 disqualified religious ministers from election to municipal offices for eight years following ratification of the Act. Article 44 specified previous laws that to remain in force along with the Act. An allegorical photograph depicting the 1905 French Law of Separation of Church and State. The 1905 law put an end to the government funding of religious groups by France and its political subdivisions. (The state had previously agreed to such funding in the Napoleonic Concordat of 1801 as compensation for the Revolution's confiscation of Church properties.) At the same time, it declared that all religious buildings were property of the state and local governments. Other articles of the law included the prohibition of affixing religious signs on public buildings, and laying down that the Republic no longer names French archbishops or bishops. Pope Pius X condemned the law in the February 1906 encyclical Vehementer Nos as a unilateral break of the 1801 Concordat. Alsace-Lorraine is still governed by the 1801 Concordat which recognises four religions, but not secularism. When the 1905 legislation superseded the Concordat elsewhere in France, Alsace-Lorraine was part of the German Empire; thus, the 1905 law has never applied there. Similarly, the law has never been applied in the overseas Department of French Guiana as it was a colony in 1905. Although the 1905 French law on the Separation of the Churches and the State initially was a particularly "painful and traumatic event" for the Catholic Church in France, the French Government began making serious strides towards reconciliation with the Catholic Church later during the 1920s by both recognizing the social impact of organized religion in France and amending the law itself through new legislation and rendering court decisions that were favorable to organized religion in France. In 1921 the Catholic Church and French State began a series of negotiations for "pacification of law" in respect to both civil and canon law to create a harmonious day-to-day working relationship. These negotiations culminated in 1926 when Aristide Briand negotiated the Briand-Ceretti Agreement with the Holy See whereby the state reclaimed a role in the process of choosing diocesan bishops. Pope Pius XII later supported what he called, "la légitime et saine laïcité". At Vatican II through the encyclical Gaudium et spes the Church recognized a belief in a non-confessional state, that the Church should not be involved in politics and that there should be a fair separation of powers marked by co-operation for the benefit of society. The Catholic Church recognizes the principle of secularism through its 2004 Compendium of the Social Doctrine of the Church, based on the principles of Luke 20:25. Pope John Paul II first condemned the secular governments and called for "the public profession of Christianity," but upon the 2005 centennial of the 1905 law he made more conciliatory statements, including: "The non-confessionality of the State, which is a non-involvement of the civil power in the life of the Church and of the different religions, as in the spiritual domain, enables all the parts of society to work together in the service of all and of the national community". The leading figures in the creation of the law were Aristide Briand, Émile Combes, Jean Jaurès and Francis de Pressensé. The 1905 French law on the Separation of the Churches and the State declared that cathedrals remained the property of the state and smaller churches that of the local municipal government. Those public authorities had to hand over the buildings to religious organizations (associations cultuelles) representing associated formed of laymen, instead of putting them directly back under the supervision of the church hierarchies. These laymen associations created under the 1905 French law on the Separation of the Churches and the State were independent legal entities having rights and responsibilities in the eyes of the law in all matters appertaining to money and properties formerly owned in France by organized religions: churches and sacred edifices, ecclesiastical property, real and personal; the residences of the bishops and priests; and the seminaries. These laymen associations were also authorized by the law to act as administrators of church property, regulate and collect the alms and the legacies destined for religious worship. The resources furnished by Catholic liberality for the maintenance of Catholic schools, and the working of various charitable associations connected with religion, were also transferred to lay associations. Implementation of the law was controversial, due in some part to the anti-clericalism found among much of the French political left at the time. The law angered many Roman Catholics, who had recently begun to rally to the cause of the Republic, supported by Leo XIII's Inter innumeras sollicitudines 1892 encyclical (Au Milieu des sollicitudes) and the Cardinal Lavigerie's toast in 1890 favour of the Republic. However, the concept of laïcité progressively became almost universally accepted among French citizens, including members of the Catholic Church who found greater freedom from state interference in cultural matters, now that the government had completely stripped itself of its former Catholic links. The Affaire Des Fiches produced a considerable backlash, after it was discovered that the Combes government worked with Masonic lodges to create a secret surveillance of all army officers to make sure devout Catholics would not be promoted. A few French politicians and communities have more recently questioned the law, arguing that, despite its explicit stance for state secularism, it de facto favors traditional French religions, in particular the Catholic Church, at the expense of more recently established religions, such as Islam. Indeed, most Roman Catholic churches in the country were built well before the enactment of the 1905 French law on the Separation of the Churches and the State, and thus are maintained at full public expense, although not always on time and to the extent that the church would like. With the exception of the historically anomalous Alsace-Lorraine, followers of Islam and other religions more recently implanted in France instead have to build and maintain religious facilities at their own expense. This was one of the arguments used by Nicolas Sarkozy, when he was Minister of Interior, to controversially argue in favour of funding other cultural centers than those of Catholicism, Protestantism and Judaism. In 2016, President Hollande proposed a temporary ban on foreign funding for mosques and shut down at least 20 mosques found to be "preaching radical Islamic ideology". These actions are consistent with Title V, Articles 26, 29, and 35 of the law. ^ a b Betros, Gemma (1 December 2010). "The French Revolution and the Catholic Church". HistoryToday. Archived from the original on 13 April 2016. Retrieved 31 July 2016. ^ Aggarwal, Manta. "The Directory (1795–99): Framing of the Constitution of France". HistoryDiscussion.net. Archived from the original on 2 July 2015. Retrieved 31 July 2016. ^ 100th Anniversary of Secularism in France, Pew Forum on Religion in Public Life. ^ Gopnik, Adam (22 December 2014). "THE FIRES OF PARIS Why do people still fight about the Paris Commune?". The New Yorker. Archived from the original on 19 March 2016. Retrieved 31 July 2016. ^ a b Bloy, Marjorie (11 November 2013). "European History". A Web of English History. Archived from the original on 9 March 2016. Retrieved 1 August 2016. ^ "Dean of French Chamber Dead" (PDF). The New York Times. 24 May 1901. Archived from the original (PDF) on 1 August 2016. Retrieved 1 August 2016. In the Chamber M Boysset was a consistent Radical Republican, supporting all measures introduced by his party. He was an ardent advocate of legislation against the religious associations. ^ a b Clark, Linda L (21 December 2000). The Rise of Professional Women in France. Cambridge: Cambridge University Press. p. 86. ISBN 9781139426862. Retrieved 1 August 2016. ^ McAuliffe, Mary (16 May 2011). Dawn of the Belle Epoque. Rowman & Littlefield Publishers. pp. 87–91. ISBN 9781442209299. ^ Raymond, G (11 October 1999). Structures of Power in Modern France. Springer. p. 118. ISBN 9780333983645. Retrieved 1 August 2016. ^ Sowerwine, Charles (8 January 2009). France since 1870. Palgrave Macmillan. p. 34. ISBN 9781137013859. Retrieved 1 August 2016. ^ a b Chastain, James (20 February 1999). "Divorce and Women in France". Ohio.edu. University of Ohio. Archived from the original on 22 March 2016. Retrieved 2 August 2016. ^ Warner, Carolyn M (27 March 2000). Confessions of an Interest Group. Princeton University Press. p. 62. ISBN 9781400823680. Retrieved 2 August 2016. ^ a b c d e f g h Guerlac, Othon (1 June 1908). "The Separation of Church and State in France". Political Science Quarterly (Vol 23 No 2): 259–296. doi:10.2307/2141325. JSTOR 2141325. ^ Holmes, J Derek; Bickers, Bernard (5 August 2002). Short History of the Catholic Church. A&C Black. p. 247. ISBN 9780860123088. Retrieved 2 August 2016. ^ Mayeur, Jean-Marie; Rebirioux, Madeleine; Foster, J R (1987). The Third Republic from Its Origins to the Great War, 1871–1914. Cambridge University Press. p. 83. ISBN 9780521358576. ^ "The Catholic World". Papers Past. New Zealand Tablet. 28 April 1904. Archived from the original on 1 August 2016. Retrieved 2 August 2016. ^ Court Room Christianity. Cornell University. 1904. p. 51. Retrieved 2 August 2016. ^ "Education in France". Report of the Commissioner of Education 1900–1901. The United States Bureau of Education. 1 September 1903. p. 1106. Retrieved 2 August 2016. ^ Acton, John Emerich Edward Dalberg; Benians, Ernest Alfred (1910). Mowat, C L (ed.). The Cambridge Modern History, Volume 12. The University Press. p. 122. ISBN 9781139055888. ^ a b c d "The Law of 1905". Musée virtuel du Protestantisme. ^ Coppa, Frank J (1999). "Chapter 7 Papal intransigence and infallibility in an age of liberalism and nationalism". The Modern Papacy, 1798–1995. Routledge. ISBN 9781317894889. Retrieved 2 August 2016. On 30 July 1904 the French terminated diplomatic relations with the Vatican. ^ "Break Between France and Rome" (Vol 37 Number 6). University of Minnesota. Public Opinion. 11 August 1904. p. 171. Retrieved 2 August 2016. ^ de Fabregues, J (1 October 1967). "The Re-Establishment of Relations between France and the Vatican in 1921". Journal of Contemporary History. Sage Publications Ltd. 2 (4): 163–182. JSTOR 259828. ^ a b c d e f g h i j k l m n o p q r s t u v w x y z aa ab ac ad ae af ag ah ai aj ak al am an ao ap aq ar as at au av aw ax ay az "Law of 9 December 1905 on the separation of church and state". Legifrance. Retrieved 2 August 2016. ^ a b "Loi du 9 décembre 1905 concernant la séparation des Églises et de l'État". Wikisource. Retrieved 4 August 2016. ^ Fehér, Ferenc (1990). The French Revolution and the Birth of Modernity. University of California Press. p. 55. ISBN 9780520071209. Archived from the original on 29 May 2010. Retrieved 3 August 2016. ^ "Napoleon's concordat: Introduction and summary". Concordat Watch. Archived from the original on 3 March 2016. Retrieved 3 August 2016. ^ a b "Vehementer Nos: Encyclical of Pope Pius X on the French Law of Separation". The Holy See. 11 February 1906. Archived from the original on 21 July 2016. Retrieved 3 August 2016. ^ a b Erlanger, Steven (6 October 2008). "A Pro-Church Law Helps a Mosque". The New York Times. Retrieved 3 August 2016. ^ a b c Decherf, Dominique (1 July 2001). "French Views of Religious Freedom". Brookings Institution. Archived from the original on 3 August 2016. Retrieved 3 August 2016. ^ Silverman, Dan P (1972). Reluctant union; Alsace-Lorraine and Imperial Germany, 1871–1918. Pennsylvania State University Press. ISBN 9780271011110. Retrieved 3 August 2016. ^ a b "Pope urges French Bishops against unbalanced secularism". Catholic News Agency. 14 February 2005. Retrieved 3 August 2016. ^ a b "EU Federalization: The Briand Plan". EU Funded Pro EU Troll. 7 June 2014. Archived from the original on 2 December 2015. Retrieved 3 August 2016. ^ "De la laïcité au laïcisme, d'une aspiration légitime à ses errements" [From secularism to secularism, from a legitimate aspiration to its errors]. ICHTUS (in French). 30 November 2012. Archived from the original on 4 August 2016. Retrieved 4 August 2016. ^ Lan T Chu (2013). "Vatican Diplomacy in China and Vietnam". In Seib, P (ed.). Religion and Public Diplomacy. Springer. p. 60. ISBN 9781137291127. Retrieved 4 August 2016. ^ Martino, Renato (2 April 2004). "COMPENDIUM OF THE SOCIAL DOCTRINE OF THE CHURCH". Vatican.va. Archived from the original on 2 August 2016. Retrieved 4 August 2016. The principle of autonomy involves respect for every religious confession on the part of the State, which 'assures the free exercise of ritual, spiritual, cultural and charitable activities by communities of believers. In a pluralistic society, secularity is a place for communication between the different spiritual traditions and the nation'. ^ Hebblethwaite, Peter (1995). Pope John Paul II and the Church. Rowman & Littlefield. p. 181. ISBN 978-1-55612-814-1. Retrieved 4 August 2016. ^ Scott, Peter R (3 March 2005). "Regnavit a ligno Deus HOLY CROSS SEMINARY FATHERS OF THE SOCIETY OF SAINT PIUS X". Holy Cross Seminary. Archived from the original on 26 February 2009. Retrieved 4 August 2016. ^ Conklin, Alice L; Fishman, Sarah; Zaretsky, Robert (15 July 2014). France and Its Empire Since 1870 (Second ed.). Oxford University Press. p. 119. ISBN 9780199384440. Retrieved 4 August 2016. ^ Usunier, Jean-Claude; Stolz, Jörg (28 February 2014). Religions as Brands. Ashgate Publishing, Ltd. p. 94. ISBN 9781409467571. Retrieved 4 August 2016. ^ Descouvemont, Pierre (1996). Therese and Lisieux. Wm. B. Eerdmans Publishing. p. 86. ISBN 9780802838360. Retrieved 4 August 2016. ^ Wright, J; Jones, H (12 June 2012). Pluralism and the Idea of the Republic in France. Springer. pp. 162–163. ISBN 9781137028310. Archived from the original on 4 August 2016. Retrieved 4 August 2016. ^ Erlanger, Steven (5 February 2015). "Old Tradition of Secularism Clashes With France's New Reality". The New York Times. Retrieved 4 August 2016. ^ Vindé, François (1989). L'affaire des fiches, 1900–1904: chronique d'un scandale. University of Michigan: Editions universitaires. ISBN 9782711303892. ^ Ibrahim, Raymond (19 July 2016). "Reuters: 'Muslim Grievances' Responsible for Terrorism in France". Frontpage Mag. Archived from the original on 20 July 2016. Retrieved 4 August 2016. ^ Malykhina, Liza (21 April 2015). "Paris mayor promises millions for crumbling historic churches". France 24. Archived from the original on 5 May 2016. Retrieved 4 August 2016. ^ "French President Rejects Proposal to Allocate Public Funding to Mosques". Morocco World News. 3 August 2016. Archived from the original on 4 August 2016. Retrieved 4 August 2016. ^ Randall, Colin (28 October 2004). "French finance minister wants state funding for mosques". The Telegraph. Archived from the original on 1 March 2016. Retrieved 4 August 2016. ^ Mulholland, Rory (29 July 2016). "French PM considers temporary ban on foreign-funded mosques". The Telegraph. Archived from the original on 31 July 2016. Retrieved 4 August 2016. ^ Serhan, Yasmeen (1 August 2016). "France's Disappearing Mosques". The Atlantic. Archived from the original on 2 August 2016. Retrieved 4 August 2016. Akan, Murat. The Politics of Secularism: Religion, Diversity, and Institutional Change in France and Turkey (Columbia University Press, 2017).